Some of the characters I discussed besides William Branham and the Kansas City Prophets, were Rick Joyner, John Paul Jackson, John Wimber and the Vineyard Movement. 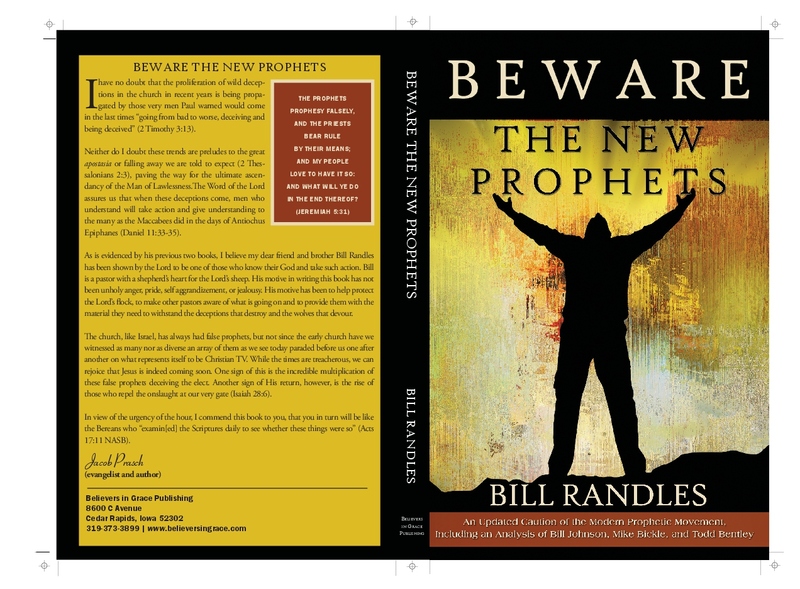 Many found it helpful and practice as countless numbers of churches and believers have been deeply damaged by the influx of false Prophets which have been afflicting the church. I’m eager to read the book, but I’ve been shortstopped by the fact that the digital edition contains embedded DRM, which prevents me from reading my legitimately purchased copy on my linux workstations. I urge you to reconsider your distribution of the digital edition, and release it in a format that does not prevent those running linux from reading the book. I have found Mike Bickle’s teachings to be excellent. Used them to teach in different Bible Studies groups. Sad that you missed out on them. Pray you will not grieve the Holy Spirit. I personally have run from the likes of Bob Jones, Paul Cain and Todd Bentley. I could also add Jerry Falwell, John Haggee, Joel Osteen, Kenneth Copland, James Dobson, and Ted Haggard to the list. I like Mike Bickle’s teachings because it causes me to go deeper into the study of the Word. I like to chew and digest on it. The deceptive thing about Mike Bickle is his love for Jesus, but his Bridal paradigm teaching is very dangerous because he is encouraging the church to seek divine union with Christ. This is a form of going “deeper” into the knowledge of Christ, according to Bickle. It can be very seductive. Many years ago I was almost lured into it. The problem with the teaching is that the church is still the Bride of Christ. We are still betrothed. We won’t consummate the relationship until the Marriage Supper of the Lamb. To seek divine union with God is a form of spiritual fornication. It’s union before marriage and it isn’t pleasing to God…and we can see the fruit of it because now Bickle has gone headlong into union with the Catholics. Be careful, Rose. We’re engaged, not married. If you love Jesus, you can’t be part of the great whore of Babylon, you must come out! This has been massively helpful to me. I have worried about not having a deeper experience and I think it is what snares others — the belief that there should be a deeper experience that is not legitimate. It is the promise of the occult and the Garden of Eden? But at the present time we walk by faith and in hope. Can’t tell you how much this has helped me. Sorry but Mike is wicked. He took over a church, then surrounding churches aggressively, and listens to false prophet Bob Jones. The people in IHOP are brainwashed. Please read up about it more. The lure is that it sounds like these people are just “so in love with Jesus.” I really wonder which Christ they are worshipping to be honest. They believe that we have to prepare the world before Christ’s return, take it over, etc. This is a false man-centered teaching. They truly think they will be God’s special snowflakes on earth and be the ones to judge the world. This is a deceptive teaching, arrogant and prideful (not to mention blatantly against scripture). I am sorry you haven’t considered Rick Warren and the new age teaching,which is very much like Rick Warrens book and his purpose driven church. I haven’t had exposure to Mike Bickle’s writings… but, from Diana’s description (above) it seems like it might have the same ‘seductive’ quality as “Jesus Calling”? This (JC) book is extremely dangerous… and not only for adults! They have ‘JC children’s devotionals’ to sell along with all of the adult variations/studies. The adulteress is VERY enticing indeed, seeking to deceive The Bride away from The Groom! (Diana, you also pointed that out!) Oh, how desperate we are for the voices of warning! Bill, have you ever taught on Jesus Calling? This woman (Sarah Young) claims to speak directly TO the reader FROM Jesus Himself! I would say that is even more than claiming to be ‘prophetic’… she is boldly blaspheming by speaking lies in Jesus’ precious Name! Complete abomination. Oh Sheep, do not listen to these other voices! We have had many false prophets up here. I survived that whole thing and I cannot agree more that we need to call out false prophets and those that call themselves apostles. The devastation left behind is heart wrenching. I agree with your recent article on division. It is not only in families but churches as well. Jesus told us to be on the watch and not be deceived. I was born again 2 years ago. I know it is a sin to worry yet I am fearful that I will be deceived as I was for 62 years. I know that I can never learn enough about our LORD, I know that I depend on him wholly to keep me on the path of light. As I see the world becoming more wicked and evil each day I get overwhelmed with tears and fears. I pain for my family that are not believers. I beg God to help me stand, to learn and to trust in him. I secretly want another human being to take me under their arms and tell me it will be okay they will not let me fall away, I will be faithful and true to the LORD. Yet I know that we are all sinners and no one can do that for me….. only God. I see the names of all these learned people and can only say Thank you God for keeping me on the path of truth and Please Lord shepherd me each day. Sherry Please cling to the good promises of God in faith such as in Jude, where he assures us “to him who is able to keep us from stumbling” and in I John where we are told the Spirit would lead and guide us,(the anointing). Keep your eyes on Jesus, love the Truth and stay in fellowship with sound people dear sister-Jesus is faithful! I have read much of your teaching Bill, and am so thankful. It was just the other day I was talkin g to my sister and happened to mention Kenneth Copeland and the Catholic church and what in the world does he think he is doing ,, and my sister go mad at me as she has also been sucked in to his teaching. watching the Jesus is L-rd for years etc. and now is trapped in that false teaching. but she talked loud for a few minutes and when she calmed down, I said a few honest truth to her and told her if she really believed that, to look it up. so she did. I really think she is questioning what she has believed for a f ew yrs. so I pray for her.. I am still shaking my head to realize after all this time so many churches have fallen for the lies. calling themselves little gods etc I have a brother that fell for Rick Warren, breaks my heart. and the ones who have fallen can be real hateful too, my brother never was but if you try to tell him the truth, he gets mad. so I pray.. thank you Bill we need more like you to STAND and tell them. and we KNOW Christ is coming for HIS Church very soon, we would be blind not to see that. love and blessings and prayers to all who stay in the world and let the HS lead us, not some false person. Prophet Wilfredo J Santos asked for $1000 and $5000 from me. I’ve yet to see the blessing!